A graffiti gang has caused thousands of pounds of damage to a north London Underground (LU) station. They sneaked into Camden Town station and covered walls, digital panels and CCTV cameras on all of the platforms with spray paint. And when they say covered - by hell, they mean it. At some point on Xmas day, while the tube network was closed, it is thought that this 'gang' walked along the Northern Line from one of its outdoor points to gain access to the tube station. While vandalism is bad kids, wandering around the Northern line with presumably access to any station on any line must have been pretty cool, as well as very scary. Dave Knapik has some spectactular photographs of the station but if you want to see it in person you better hurry up as clean-up was well underway yesterday. 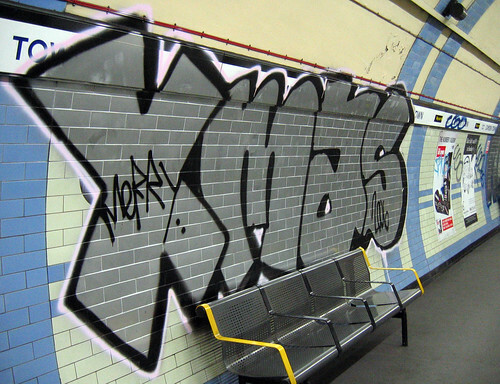 Transport Police are scouring CCTV footage to find the culprits but some rumours are even claiming with Santa's Grotto out of the way, Banksy could be the one behind this chapter of the graffiti war. Brixton photo taken from Chumpolo's flickr stream and Alex Buchanan has some even more colourful and amazing ones.